The close season began with the laying of (another!) playing surface and the departure of Chris McCart. The former captain and cup winning hero left quietly and without ceremony but with the best wishes of the fans. Ross McCormack moved to Wales, John Sutton signed up, Jim O'Brien joined from Celtic and John Kennedy didn't. The first action at Fir Park saw Wolves, Bradford then Preston North End visit to finish the pre-season build-up. The SPL computer handed us a brutal start with games against the best six in the league. 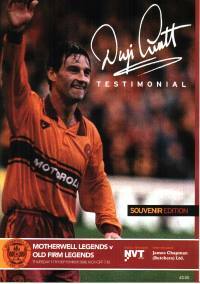 We started at Tynecastle where, despite equalising twice, we lost to a Mikolunas strike a minute after our second goal. Game 3 saw our first point on the board thanks to a 1-1 with United at Fir Park and we had to wait until the end of August for the first win. It arrived thanks to a Sutton goal at Easter Road. Our away trip to France was sandwiched between defeats to both Glasgow clubs but such was the attention on the European adventure that it hardly seemed to matter that we had taken only four points from the first six games and were in second bottom place. 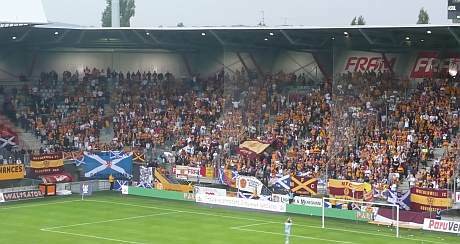 Despite the badly planned scramble for tickets, thousands of Motherwell fans managed to congregate in Stanislas Square in the centre of Nancy for a claret and amber festival before trooping off to the stadium in procession. The 1-0 loss kept our hopes alive but the dreams were shattered by two first half goals in the second leg. The gulf in class between the teams was huge. The Nancy team were faster, stronger and had a technical ability far beyond our capabilities. October arrived to find us out of both the Uefa and CIS cups. Our embarrassing exit to the minor competition followed an extra time goal from Accies at home but our league form took a turn for the better. Wins against St Mirren, Falkirk, Inverness and Hamilton saw us shoot up the table and we were in third place after eleven games. Was it possible that we could repeat the previous season's heroics? Sadly, no. We had a disastrous spell from the start of November until Christmas during which we amassed one solitary point from seven games. Injuries and suspensions cost our limited squad dear. Clarkson was red carded at Parkhead, Quinn was sent off at Pittodrie and Craigan was injured for weeks. The losses to Falkirk and Hibs were possibly the low points and we could not complain about being joint bottom with only one game left before New Year..